Secondary Bone Cancer- Cancer that started somewhere else in the body and then spread to the bone (Thyroid, Breast, Lung, Kidney, and Bladder Cancer). Does it affect Age, Genetics, Gender, and Race? No, anybody can get bone cancer. There are some types of Bone Cancer that are more likely to affect different age. Osteosarcoma and Ewing Sarcoma for example is more common in younger people while Chrondosarcoma is more common in older people. People with inherited diseases such as Li-Fraumeni syndrome or Rothmund-Thomson syndrome have an increased risk of getting bone cancer. Ionizing Radiation can increase the risk of getting Bone Cancer. The most common sign of bone cancer is pain, but other signs include. Symptoms vary depending on where on the bone and the size the cancer is. Treatment would include Chemotherapy, Radiotherapy, Amputation, and Painkillers. And since bone cancer can reoccur regular visits to the doctor are necessary. Osteosarcoma affects people between ten and thirty and is the most common type of bone tumor. And is more common in teenage boys. A symptom might be a lump in the infected spot for weeks. Chrondosarcoma occurs in fifty or older. Chrondosarcoma starts from the Cartilage cells. It usually occurs in the Pelvis, Knee, Shoulder, or the Upper Part of the Thigh. Ewing Sarcoma is more common in people under nineteen and is more common in boys then girls. Ewing Sarcoma's tumors are usually located in the diaphysis or mid shaft of the bone. 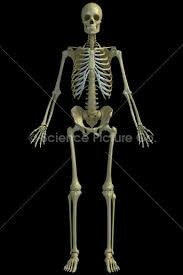 Its most common bones to infect are Pelvis, Femur, Tibia, and Fibula (The Two bones in you lower leg). Soreness where the tumor is and swelling or warmth is the most common sign. 3,010 cases will be diagnosed. "About Bone Cancer." About Bone Cancer. N.p., June-July 2013. Web. 06 Dec. 2013. "Bone Cancer Basics." EverydayHealth.com. N.p., n.d. Web. 05 Dec. 2013. "Bone Cancer: MedlinePlus." U.S National Library of Medicine. U.S. National Library of Medicine, 15 Nov. 2013. Web. 10 Dec. 2013. "Bone Cancer Treatment." EverydayHealth.com. N.p., n.d. Web. 19 Nov. 2013. Clayman, Charles B. "Page 37 and Page 228." The Human Body: An Illustrated Guide to Its Structure, Function, and Disorders. London: Dorling Kindersley Pub., 1995. N. pag. Print. Cotterill, Simon. "The Skeletal System (Bones) | Medical Terminology for Cancer. "The Skeletal System (Bones) | Medical Terminology for Cancer. N.p., Feb.-Mar. 1996. Web. 10 Dec. 2013. "KidsHealth." Ewing Sarcoma. N.p., n.d. Web. 10 Dec. 2013. "KidsHealth." Osteosarcoma. N.p., n.d. Web. 05 Dec. 2013. "The Skeletal System (Bones) | Medical Terminology for Cancer." The Skeletal System (Bones) | Medical Terminology for Cancer. N.p., Mar.-Apr. 1996. Web. 05 Dec. 2013. "TeensHealth." Types of Cancer Teens Get. Ed. Robin MIller. N.p., Sept. 2010. Web. 05 Dec. 2013. 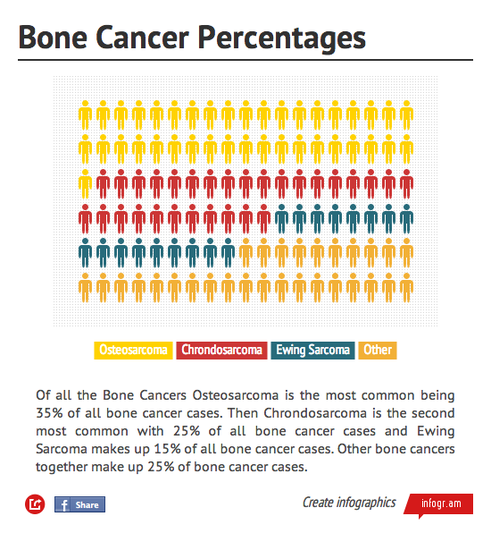 "What Are the Key Statistics about Bone Cancer?" What Are the Key Statistics about Bone Cancer? American Cancer Society, 13 June 2013. Web. 10 Dec. 2013.